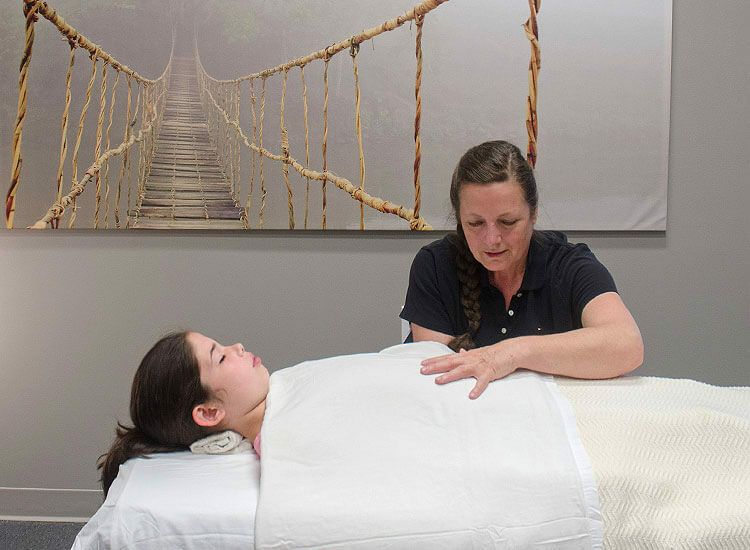 Craniosacral therapy is a form of therapeutic massage that affects the membrane system of the central nervous system, the cerebrospinal fluid, cranial bones, and the fascia which is an all enveloping, uninterrupted type of connective tissue throughout the human body. This therapy incorporates non-invasive, soft touch to encourage the release of tension, blockages and restrictions resulting from any form of trauma. Craniosacral therapy aims to re-establish the integrity of the craniosacral system and helps release restrictions throughout the continuum of the fascia. Craniosacral manipulation techniques are designed to support and take advantage of the body’s own tendencies to seek balance within its tissues. Light and gentle soft-tissue manipulations are used by the therapist to monitor the movement of the cerebrospinal fluid and observe it’s rhythm, symmetry, amplitude, quality, speed and vitality. The therapist uses a manual technique and relies on cues from the client’s body to determine the focus of the treatment session. A specific hands-on “listening” protocol is applied along several areas of the body from the feet to the head. The client may report noticing changes in body temperatures, tingling, a letting-go, clearer thinking and/or heightened senses. Craniosacral therapy is appropriate for all ages and conditions. This therapy is safe for clients with post concussive symptoms, healed brain and spinal injuries, and birth trauma. It may be used in conjunction with other therapies to enhance their outcomes such as physiotherapy and classic massage. Craniosacral is beneficial for clients experiencing mental illness such as depression, anxiety, obsessive-compulsive disorders and generalized stress. Clients also report improvements to their quality of sleep, hormone regulation and decreases in blood pressure. It is recommended that clients book a 60-minute session to receive the most benefits from this treatment. To book a craniosacral massage, call 613-635-7026.